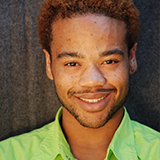 Dairrick is ecstatic to be making his lyceum debut with A Fundamental Change. Hodges is a San Diego native who discovered his love for performance in the third grade before going on to attend the San Diego School of Creative and Performing Arts and has been an active member in the artistic community in San Diego and throughout California ever since. Check out the Bio page to read more.